St. Louis Radon | What Is Radon Gas? Home > What is Radon? Radon is a colorless, odorless naturally occurring radioactive gas that is produced by the breakdown of uranium in the earth's crust. Radon is the number one cause of lung cancer in non smokers, second only to the number of lung cancer incidents from cigarette smoking. If you are a smoker, you are at much greater risk of getting lung cancer when combined with elevated radon levels in your home or office. As you breath, radon gas enters and exits your lungs. Decay products can become lodged in your lungs. Radon is estimated to cause approximately 21,000 lung cancer deaths per year. Polonium 218 and 214 from the radon gas decay chain release Alpha radiation. Alpha radiation does the most damage to the lung cell tissue. Alpha radiation moves slower and with greater impact than gamma and beta radiation, which are also released during the radon decay process. The energy emission travels less than a few inches, but is strong enough to pit plastic in the long term alpha track testing devices. To understand the characteristics of radon and it's decay products, think in terms of a continuous process of subatomic particles changing from mass into energy and from energy into mass. Radon gas prior to decay is a noble inert gas, meaning it doesn't interact, or bond with other atoms (or lung tissue). It is the decay chain particles, and the alpha radiation release that causes lung cancer. While colorless, odorless and tasteless, Alpha energy release from the radon atom can be seen for scientific observation within what is known as a cloud chamber. 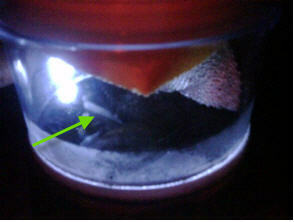 Below is a picture of the release of the alpha radiation from a radon atom within a cloud chamber. Radon is measured in PiccoCurries per Liter of Air, (pCi/L). Pico = one trillionth. And 1pCi/L = 2.22 decays per minute per liter of air. So then, 4pCi/L equals 10 decays per liter of air per minute. It would take approximately 2,500 radon atoms per square inch to create a radon concentration of 4pCi/L. Radon is considered a low level amount of radiation and everyone is exposed to natural radiation everyday. Radon gas accounts for 55% of a typical person's radiation exposure followed by CAT scans as the second leading source of radiation exposure at 11%. 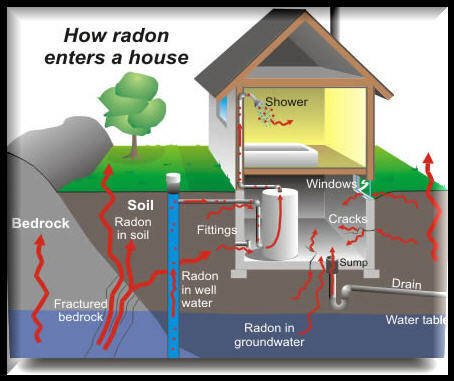 Radon gas enters the home through the slab, basement, or crawl space. Pressure differences within the home (from warm air rising and other natural effects) pull radon into living spaces from the soil. 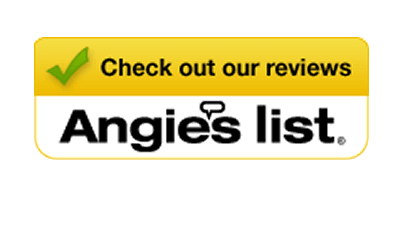 Furnace & air conditioning systems can distribute the air through the structure. Nearly 1 out of every 5 homes in Missouri is estimated to have elevated radon levels.